To ride or not to ride? That is the question. This week is doing me in. After finishing the century on Saturday, I thought I would recover a few days and then be ready to get back at it. Unfortunately, this week has not gone the way I expected. I hit the ground running at work this week. It is been one of those weeks where the days end and you wonder where it went! To compound things, I was out on Tuesday with some sort of reverse fever business. My temperature was under 97 and I just wanted to sleep. Every evening has had some activity that has kept me off the bicycle. Needing to continue work on the foundation has kept me up later than usual. Tonight and tomorrow night don’t look to be changing that trend. It really has me wondering if I should do the Hincapie Gran Fondo on Saturday. I haven’t ridden in a week. I’m not feeling that strong. I need a break. On the other hand, opportunities like this don’t come along every day. It’s going to be a beautiful day. On the other hand, this was to be my “last ride” of the year. Once the fondo was in the bag, I planned to focus on off season cross training and maybe do a little more core work. Then there is that matter of having just acquired some knobby tires. The ride is also a great opportunity to ride with some characters from the pro cycling world. Of course, the chances of me actually riding with them are pretty slim. Riding in a crowd of hundreds of other cyclists following along behind the pros isn’t really riding with them. Frankly, the thought of getting in that big crowd of riders just isn’t that appealing. I truly am torn. I want to do the ride, but I just don’t know if I am able. If I didn’t ride, then Thing Two and I could take out our mountain bikes for our first real ride together. That would be great, but I do realize that there will be many opportunities to do that in the future. Riding in George’s “retirement party” ride is a once in a lifetime deal. So, I’m asking you. What should I do? Of course, I’ll let you know what I decide. This entry was posted in Events, Rides and tagged Gran Fondo, Hincapie on October 25, 2012 by Jonathan Pait. A formal Press Conference at Hincapie Sportswear will introduce media and invited guests to the new activities and sponsors related to the dual national championships for professional cycling – the Greenville Hospital System USA Cycling Professional Championships. This is the fourth consecutive year that Greenville will host the GHS USA Cycling Professional Championships. The Professional Individual Time Trial National Championship will be held Saturday, August 29. The Professional Road Race National Championship will be held Sunday, August 30. Both professional events are free for spectators, with hospitality packages available to purchase. Over 200,000 spectators have watched the GHS USA Cycling Professional Championships in the past three years, and more than $278,000 has been raised with Stars & Stripes Challenge events for cancer research, benefiting the Greenville Hospital System Oncology Research Institute, Activate Upstate and the Lance Armstrong Foundation. This entry was posted in Events, Racing and tagged Hincapie, Press Conference, Professional Championships, Stars and Stripes, USA Cycling on May 12, 2009 by Jonathan Pait. Yesterday I finished up a couple of meetings and then couldn’t resist getting out on my bike to head out for a ride. The weather was incredible and the roads were dry from the recent rains. As I rode over Paris Mountain, I couldn’t help but laugh out loud! I tried my best to keep my power down and my cadence high as I climbed. Wow, was that hard! I was as easy as I could go on the gears. If I tried to increase my cadence, my power would increase to around 200 watts. If I tried to lower my power, I would come to a near standstill. Finally, I stopped trying and just rode by perceived exertion. I figured if I didn’t feel like I was riding hard, hopefully I wasn’t! Of course, going down the Furman side had my heart rate down in no time. Tomorrow, I am planning on riding in the Breaking the Chains of Cancer ride. It is a benefit ride for one of the founding families of cycling in the Carolinas, the Sullivans. It’s close to me because one of my riding brothers from Team One on the Austin trip is Joey Sullivan. Susan Sullivan, Joey’s wife, has been battling ovarian cancer for quite some time. Doctors have suggested she try a new series medicine due to the fact that the current regiment of chemotherapy has not been producing the most positive results. These new medicines are not covered by insurance making the costs extremely high for the family. This ride was organized from within the Greenville cycling community to help alleviate this expense. The Sullivans have given a lot to cycling in the Upstate over the years and this is a way to show our support for the family. Besides, we have to keep Susan healthy so she can keep Joey under control! There is still time to sign up if you are interested. George Hincapie will be joining the 65 mile ride. There will be autographed jerseys and photos from George given to the top donors. There are also special single run jerseys from Hincapie sportswear available for purchase with all proceeds going to the Sullivan Benefit Fund. The rides will start and finish at Carolina Triathlon Downtown. Pre-Registration is $35.00 and $40.00 day of the ride. Registration can be done at www.pre-reg.com. Click on cycling and then Sullivan Family benefit ride. Head on over to Pre-Reg.com and sign up for the ride today. It’s going to be a warm day and the rain should be spotty. You know you want to be out on your bike… why not help make a difference in a lives of a family while you ride? 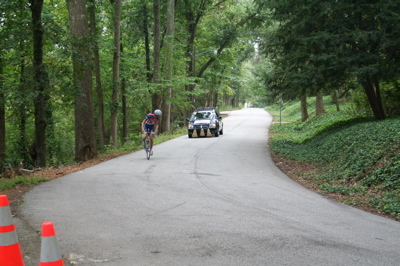 This entry was posted in Events, Rides and tagged Hincapie, Sullivans on December 19, 2008 by Jonathan Pait. The Hincapie Path is part of the Swamp Rabbit Trail which many hope will someday run from Conestee to Travelers Rest. The section of the trail bearing his name stretches from Woodland Way in Greenville’s Cleveland Park to East Faris Road near Greenville First Baptist. Greenville mayor, Knox White, began the event explaining some of the vision for trail. George Hincapie said a few well received words following the unveiling of a trail sign bearing the name “Hincapie Path.” The Hincapie family then joined him and city officials to cut the ribbon to officially open the path. Many members of the Palmetto Peloton Project’s Challenge to Conquer Cancer riders were there to support this great addition to an active Greenville community. These riders recently returned from a week long cycling trip to Austin, Texas to participate in the LiveStrong Challenge. This entry was posted in Events, Rides and tagged Cleveland Park, Hincapie, Rails to Trails, Swamp Rabbit Trail on November 1, 2008 by Jonathan Pait. Its Saturday and no rain, so…. that means that it was time for the Sunshine Cycle Saturday morning ride. Man, was it cold! Really, it wasn’t that cold – probably the high 40s or low 50s, but when you are out in summer riding gear and you get up to speed, it gets cold. We did about twenty-eight and a half miles like we normally do. I was relieved we didn’t do Woodhaven. That would have croaked me. The most fun I had was on a long gradual climb. I hooked up with Ed and Tony (two of the better riders) and we dropped the whole group and finished yards ahead of everyone. I managed to finish in the top two or three of most of the sprints, but the last couple of climbs, I just ran out of gas. I didn’t make the 100 miles this week as I had hoped, but I did get more than 70. I’ll try again this week to get in some more. I think if I can get in a ride on Tuesday night, that will help. 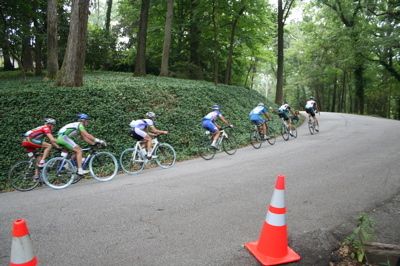 This entry was posted in Rides and tagged Hincapie, Hour of Power on September 30, 2006 by Jonathan Pait. Today, I took my trusty Pro-Flex and headed to Cleveland Park. There is a spot on Woodland Circle that I thought would be a good place to take some pictures. 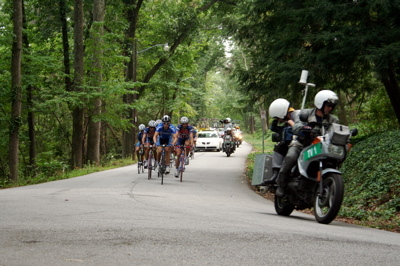 Here I’m including some pictures from lap three of the USA Cycling Professional Championship. By the way, George Hincapie, riding on his home course, won the race. Here the leaders (at that point) head up the hill after going through the feed zone. Most had taken on their carb load by this time. In this first group, I could only pick out Levi Leipheimer in this group. It was hard to distinguish who was who looking through a view finder. The pictures didn’t tell me much either. There was a small group of riders between the initial group and this one. Again, I couldn’t figure out any of these riders. If you know any of them, point out which is which. This picture is sad and kind of funny in a sick sort of way. I watched this lone rider come up the hill. He was plodding along. He then looked back and saw the sweeper car coming up behind him. Suddenly he put his head down and pushed a little harder. I’m afraid that before the day was over, he had to get off the bike and get in the van. He was fading and he still had to do Paris Mountain two more times. This entry was posted in Racing and tagged Hincapie, Pro Champions on September 3, 2006 by Jonathan Pait. I guess Following Hincapie will become Following Landis. Of course, I’m still keeping up with George, but there is no way he will now win the Tour. Landis is the American best in position to take the yellow on the final day. Sure wish he rode for an American team, but I guess I’ll have to pull for Phonak. According to Rich Hincapie, his brother came into the tour too light. He seems to start out the stages just fine, but then fades. It was obvious during the time trial that there were going to be problems. Don’t give up George! This entry was posted in Racing and tagged Hincapie, Landis, Tour de France on July 15, 2006 by Jonathan Pait. I’ve been following the Tour de France pretty closely again this year. It is actually kind of nice not to have Lance in the mix. There is a huge question mark this year. Eight to ten riders seem to have a legitimate opportunity to win this year. It could even be someone not on the radar (though I doubt it). There is still a long way to go and the mountains still loom in the distance. I’m hoping that Hincapie can save up his strength and then pull an Armstrong when we get to the mountains near the end of the tour. Yesterday the Greenville News started a blog written by George’s brother Rich. I hope it will really be a worthwhile blog and we can pick up some insights that you don’t normally get from the media more focused on all the riders. You can find the blog here: Hincapie follows Hincapie. Yes, I have not missed the irony of a NASCAR fan following cycling in France. I guess it is an example of the changing demographics in the sport – both sports. This entry was posted in Racing and tagged Hincapie, Tour de France on July 7, 2006 by Jonathan Pait.